Vietnamese Teachers’ Day is coming… On this occasion, we shall look back on the milestones in the past of our beloved school through past celebrations in November 20th. 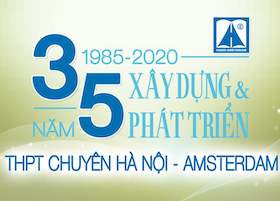 1985 was the year in which Hanoi Amsterdam High school for the Gifted was established. At the time, the school consisted of only 50 teachers who were transferred from other specialised schools. The teachers had encountered many difficulties in their teaching missions due to the lack of facilities. 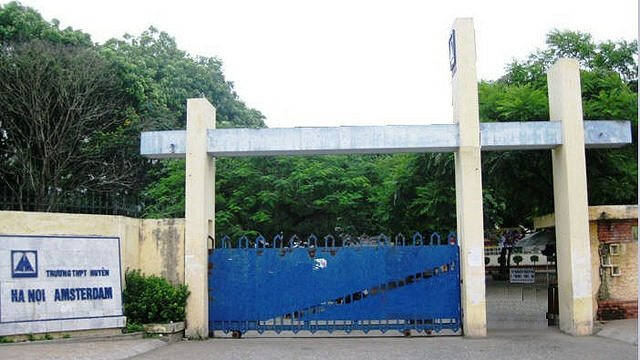 It is undeniable that without the teachers’ credits for incessantly studying, researching to advance their profession, and renovating different methods to convey their lectures as well as compiling engrossing lectures which aroused passion for studying among students, Hanoi Amsterdam High school for the Gifted would not have become such a household name like it is today. In 20/11 that year, the first generation of Amsers had expressed their sincere love for teachers through letters. The letters, though not perfectly written, clumsy, and naive had shown their gratitude and heartfelt affection towards teachers. This was, furthermore, a motivation for teachers to overcome financial difficulties, maintain their noble career of education. After 30 years of formation, improvement, and advancement, Hanoi Amsterdam High school for the Gifted celebrated 20/11 with an entirely different state of mind. The school had become not only modern and well-equipped, but also the very frontier of specialised high schools, with prideworthy achievements. All of the school’s accomplishments were undeniably constituted by considerable contributions from school’s administrators, as well as previous teacher generations. Throughout the journey of 30 years, teachers and students of Ams had always shared many difficulties in study and in life in order to affirm Vietnam’s intelligence with international friends. 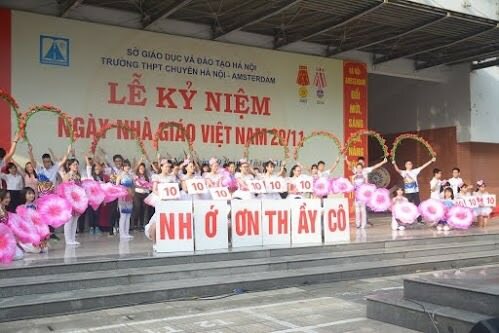 In 20/11, the students of Hanoi Amsterdam High school for the Gifted had expressed their gratitude and deference towards teachers through excellent achievements in national and international competitions, as well as brilliantly-coloured bouquets, sincere and original poems, self-composed songs. Furthermore, the gratitude of many generations of Hanoi Amsterdam High school for the Gifted’s students was also delivered through a heart-touching ceremony with the topic of Hanoi Amsterdam “30-year journey and future aspirations”. 20/11/2017: Inauguration of Hanoi Amsterdam High School for the Gifted’s traditional space. 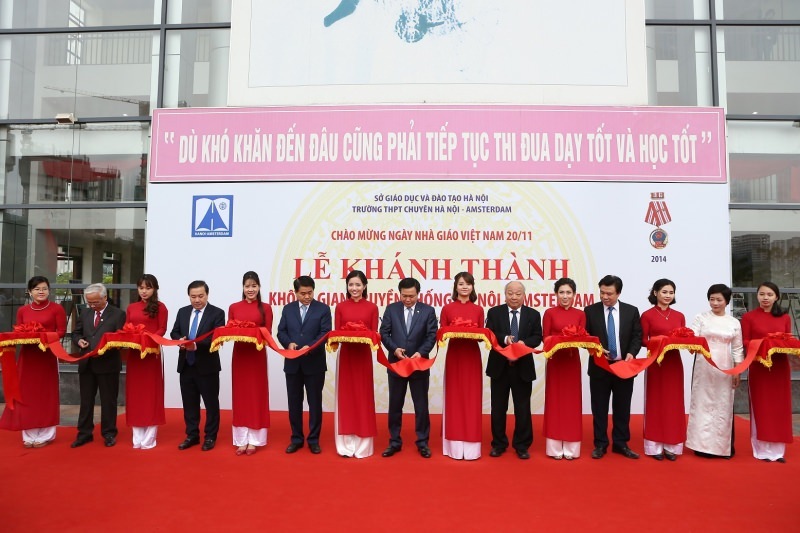 In the joyful and festive atmosphere of Vietnamese Teachers’ Day 20/11 in 2017, Hanoi Amsterdam High school for the Gifted had solemnly held the inauguration ceremony of “Hanoi Amsterdam traditional space”. Designed based on French consultative specialist Varonique Dollfus’s original ideas on techniques and materials, the traditional space, with 4 exhibitions: “Everlasting values”, “Historical milestones”, “Hearts’ imprints”, and “Towards the future”, had acknowledged the school’s honourable accomplishments in international competitions, became the motivation urging students and teachers of future generations to strive in studying and training as to continue the school’s condition. 20/11/2017 has become a momentous milestone in the history of Hanoi Amsterdam High school for the Gifted, as well as the government’s recognition of the school’s contributions in our country’s education. Vietnamese Teachers’ Day 2018 is about to come. We respectfully wish our teachers to always be healthy, joyful and continue to succeed in the career of delivering knowledge.